Mount where you need permanent access at crossover points. The upper platform features removable two sided 42" high handrail with 21" mid-rail and fixed 4" toeboards to prevent objects from rolling off. Serrated steps for extra grip and safety are 24" wide and 7" deep with a step height of 10". 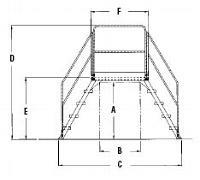 The angle of the steps is 58°. The overall ladder width is 29". Ground legs include floor mounting pads. Units must be anchored to the floor. Units are all welded steel construction but can be knock-down for storage and shipping. Uniform capacity is 500 pounds. Meets OSHA 1910.25. Powder coat yellow finish. 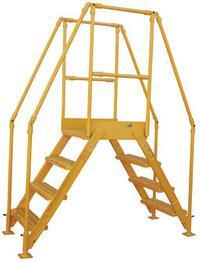 Note: The Cross-Over Ladders meet OSHA 1910.25 ladder standard as a Ships Ladder. 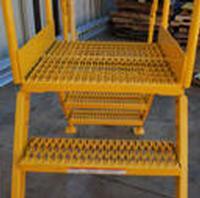 The Cross-Over Ladders do not comply with ANSI A14.7 - this standard only pertains to rolling ladders.